Premium steaks, a vast wine list and big bills at the end of it all sums up the III Forks experience. : What III Forks lacks in subtlety, it makes up for in quality. This over-the-top monument to meat looks like a cross between the Taj Mahal and the O.K. Corral, with miles of mahogany bars and white linen tablecloths tossed together with antler chandeliers and western artwork. 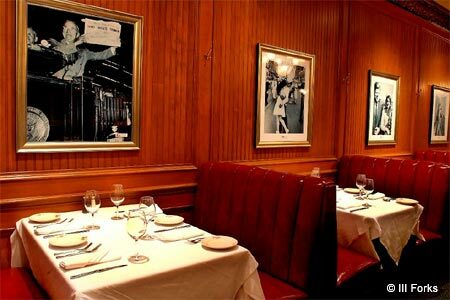 The restaurant is all about big: big steaks, big lobsters, big wine list and big bills at the end of it all. However, the good news is that the colossal steaks come with an array of sides served tableside: duchess potatoes, fresh creamed corn, sugar snap peas, scallions and sliced tomatoes. Snappy, conscientious service sets the stage for your evening of carnivorous overindulgence, making it easy to relax and enjoy your seared, fork-tender New York strip or rack of lamb. Desserts have included a Grand Marnier crème brûlée.